Bounce Back! is a whole school program from Foundation to Year 6 which provides students the skills to ‘bounce back’ when they experience sadness, difficulties, frustrations and challenging times. This completely updated and revised program contains an updated Handbook exploring the most recent evidence-based research that underpins Bounce Back! plus ten substantially revised Curriculum Units, all with updated topics, teaching strategies and resources. How to use Bounce Back! Chapter 1 What is the Bounce Back! program? Chapter 6 Implementation and maintenance of Bounce Back! more suggestions for differentiation and program implementation. develop strengths, skills and attitudes for being successful. Dr Helen McGrath is an Adjunct Professor in School of Education, Deakin University and the School of Education, RMIT University. She is also a counselling psychologist in private practice, a member of the National Centre Against Bullying and was the lead developer of the eSmart Cybersafety Framework and Investigator on the Australian Government’s Scoping Study on Approaches to Student Wellbeing. Toni Noble is an Adjunct Professor for Positive Psychology and Education at the Australian Catholic University (ACU) and lead investigator on Australian Government’s Scoping Study on Approaches to Student Wellbeing. Both are authors of numerous academic papers, chapters and books for teachers, health professionals and the general community and were co-developers of the National Safe Schools Framework (2011) and the Safe Schools Hub (now Student Wellbeing Hub. They are authors/co-authors of the following teacher resource books: Friendly Kids, Friendly Classrooms; Different Kids, Same Classrooms; Eight Ways At Once Book 1 & 2; HITS & HOTS - Thinking + Teaching + Social Skills; Bullying Solutions and The PROSPER School Pathways for Student Wellbeing - Policy & Practices. They are also popular speakers and workshop presenters. To find out more about Bounce Back! visit www.pearson.com.au/primary/bounceback. Pearson 9781488618727 9781488618727 Bounce Back! 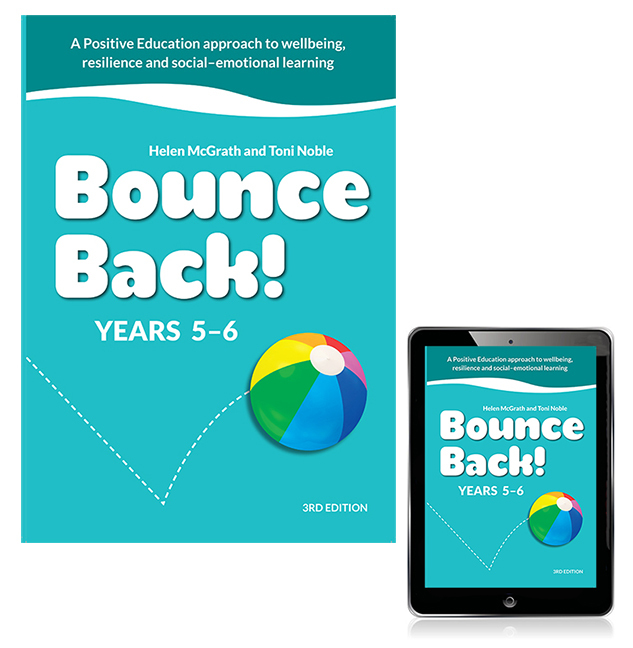 Years 5-6 with eBook Bounce Back! is a whole school program from Foundation to Year 6 which provides students the skills to ‘bounce back’ when they experience sadness, difficulties, frustrations and challenging times. This completely updated and revised program contains an updated Handbook exploring the most recent evidence-based research that underpins Bounce Back! plus ten substantially revised Curriculum Units, all with updated topics, teaching strategies and resources.